The wig is NOT included! 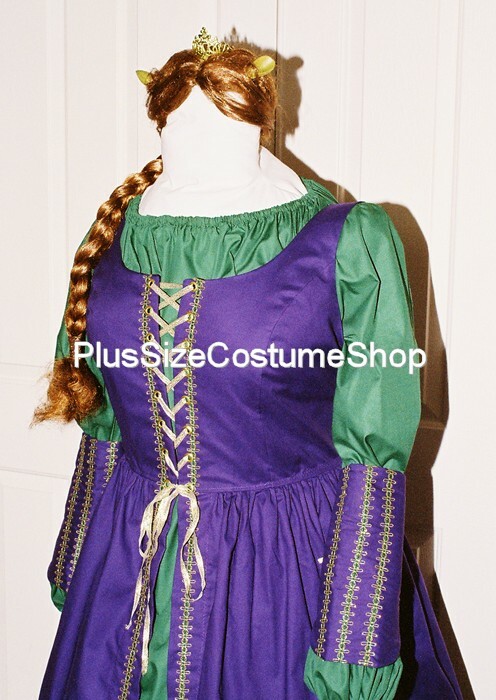 The overdress is made of royal purple cotton with green and gold trim down the front (trim may vary). The bodice part is lined and boned at the lacings. It laces up through professional-strength grommets. The long-sleeved peasant shirt is made of green cotton and has elastic in the sleeves and neckline. The length is approximately 32”. The skirt is made of green cotton and has an elastic waistband. It will be hemmed at 44" (extra long - will usually work for someone up to 6'2" tall) unless a shorter length is requested. The bracers are made of matching purple cotton with rows of trim. They lace up through professional-strength grommets and are interlined for sturdiness.